James is a six-year Navy veteran where he served as a hospital corpsman working in the laboratory. 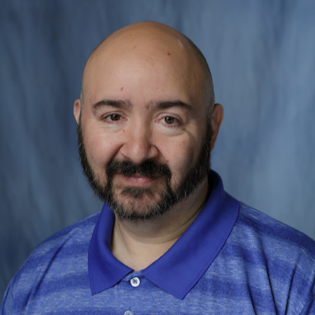 He has taught a variety of courses, from lab procedures for medical assisting students to middle school English and technology, to prep reading and writing for community college. He has worked with education technology since 1997 and has been working exclusively with online education since 2010. James works with faculty to design and maintain courses for undergraduate and graduate nursing programs; assists faculty and students with technical issues with the LMS and other instructional technologies; trains faculty on new educational technologies; and researches new technology to enhance the classroom and online experiences. James has included Yellowdig in 26 online classes between Summer 2017 and Fall 2018. Given the topics in the Nursing classes that James designs he has used Yellowdig a lot for responding to and discussing case studies and for creating conversation around ethical considerations for the nursing field. For most courses the point goal has been 200 with Pins worth 10 points, Comments worth 5, and Likes/Loves worth 1. He typically uses a weekly maximum of 20 and uses the automatic grading feature to send grades to the Canvas gradebook. The course offerings he has used Yellowdig for have been quite varied and aimed at a number of different levels of student: Nursing Informatics and Information Management; Leading Quality Improvement Practice Initiatives; Health Policy and Finance in Advanced Nursing Practice; Leading Quality Improvement Practice Initiatives; Public Health Nursing; Legal and Ethical Issues in Nursing; Healthcare Policy, Finance, and Regulatory Environments; Psychopharmacology for Psychiatric Nursing; Nursing Informatics and Information Management; Population Focused Care; Physiology and Pathophysiology for Advanced Nursing Practice; and Health Promotion. James’ 26 classes using Yellowdig have included an average of 48 students per class (Median = 36; Range: 15 to 123; Total = 1239) with activity over an average of 16.6 weeks (Median = 18.2; Range: 1 to 24). Over that time students in each class made an average of 294 Pins (Median = 240; Range: 25 to 1229) and 1071 Comments per class (Median = 909; Range: 51 to 2493) or 6.1 Pins and 23.2 Comments per student. There was an average of 4.1 Comments per Pin (Median = 3.5; Range = 1.9 to 10.0).